Fire at Trenton rowhome on December 18, 2016. A raging fire at a Trenton rowhome believed to be vacant tragically left one man dead on Sunday after neighbors heard the victim frantically shouting for help in the boarded up property. 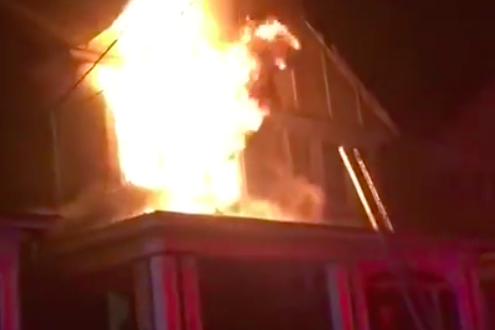 The fire broke out on the second floor of a city-owned vacant property on Sanford Street shortly after 2 a..m., according to The Trentonian. A witness at the scene told the newspaper that a homeless man had been living inside the house after returning from a stint of 60 days in jail. Several city residents attempted to save the man, the witness said, but were unable to access the property because its entryways were sealed. The same witness said he believed the man struggled with drug addiction. Firefighters arrived at the scene around 3:15 a.m. and found the victim, who was not identified deceased inside the property. The cause of the fire was not immediately revealed.